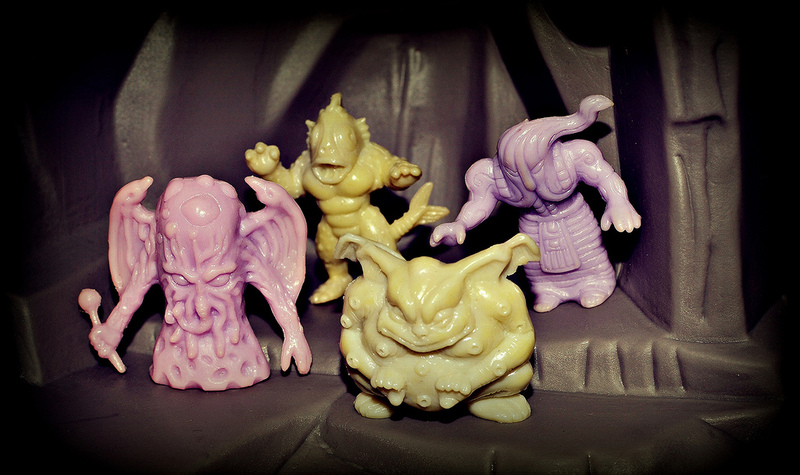 While most of the many monsters in the Japanese keshi line/RPG Neclos Fortress were inspired by mythological creatures and Dungeons & Dragons-type characters, at the end of its run creatures from the works of H.P. Lovecraft were introduced. The main villain of the line was the title character Neclos, but in the eighth and final set/series, the storyline seemed to take a turn so that famous Lovecraftian cosmic entity Cthulhu appeared and became a new "boss" foe for the heroic characters to battle. It's hard to tell exactly what the storyline was as any overview of it that can be found online is in Japanese, but whatever it was lead to a handful of Lovecraft-based monsters being added to the line. CTHULHU: The most popular Lovecraft creature is represented in Neclos as something that looks like a cross between an octopus and a tree trunk. I've seen some people say they don't care for this figure, but it actually works for me. 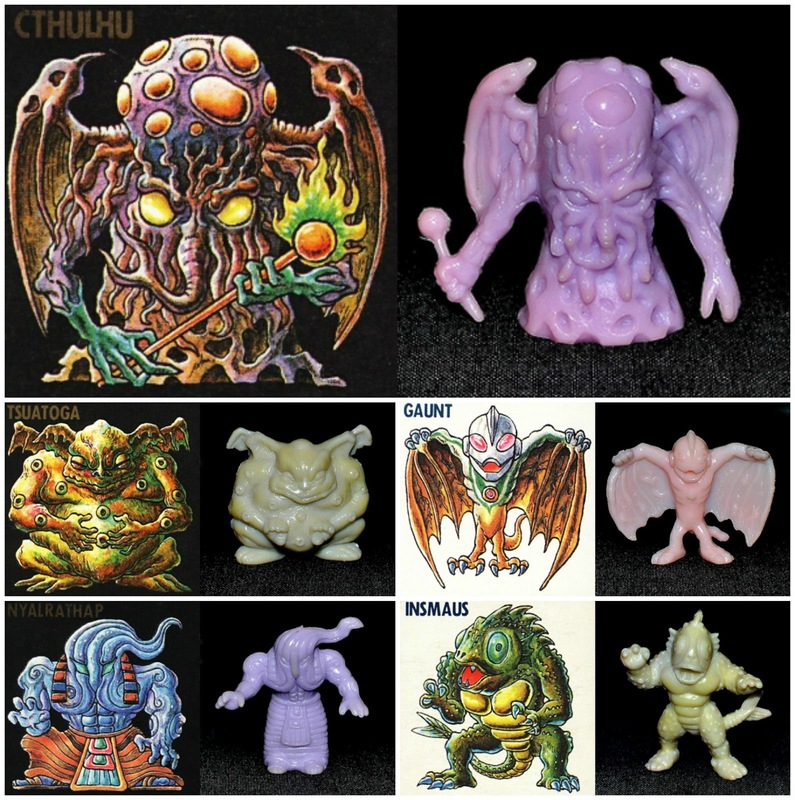 Cthulhu is one of the rarest Neclos figures, and probably the most sought after of them all. TSUATOGA (TSATHOGGUA): This character was created by Clark Ashton Smith and first appeared in print in Lovecraft's "The Whisperer in Darkness." He was described as "squat and pot-bellied, his head was more like a monstrous toad than a deity, and his whole body was covered with an imitation of short fur, giving somehow a vague sensation of both the bat and the sloth," which is in line with how the character was interpreted for the Neclos line. GAUNT: I'm assuming this is supposed to be based on one of Lovecraft's Night-Gaunts, but as far as why it has Ultraman's head, your guess is as good as mine. NYALRATHAP (NYARLATHOTEP): Another Lovecraft deity, this one with an Egyptian-sounding name. I'm not sure what his role was supposed to be in Neclos. Maybe one of Cthulhu's henchmen? INSMAUS (INNSMOUTH): It seems that in Lovecraft's works, Innsmouth was a town, not a monster. In Neclos Fortress, it's a fish-man baddie. What do you think of the Neclos interpretation of these characters? Can you identify any other Lovecraft-based characters in the Neclos lineup? Check out all the figures at neclosfortress.com and let me know if I missed any! Great post. My take on the spelling for a couple of these (INSMAUS and TSUATOGA) is they may be romanizations of the Japanese pronunciations of the names. So Innsmouth first became something like "インスマウス" in Katakana, which, in a kind of personalized romaji, then became "Insmaus." I see this sort of transformation sometimes when foreign words go from English -> Japanese -> English. Thanks for the info! Many of the character names are misspelled throughout the entire Neclos series, so that must be what caused it. Andy b is correct on the English --> Japanese --> English messing up the names. Whoever localized the game for English speakers likely wasn't familiar with Lovecraft's work, leading to the missed reverse translation. Also, the Shadows Over Innsmouth story is about Deep Ones, who are indeed fish-people. They got the monster right, just missed the name. Cool, thank you for the clarification about the Deep Ones/Innsmouth.